There is increasing chatter among mostly European diplomats that their nations’ displeasure about President Donald Trump would best be shown by staging a diplomatic boycott, namely, recalling ambassadors in Washington and leaving only chargés d’affaires in charge. This type of measure has been used in the past to show opposition to the domestic and foreign policies of foreign governments. Recently, Saudi Arabia led such a boycott, albeit for spurious reasons, against Qatar. Many nations have recalled their ambassadors to Israel following moves by that country against Palestinians. 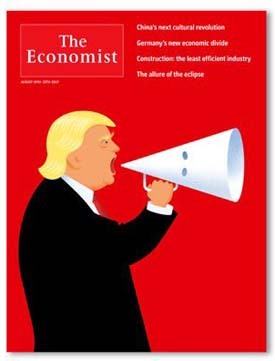 The disgust and frustration by Europeans over Trump’s defense of neo-Nazism and Ku Klux Klan protesters in Charlottesville, Virginia, is evident on the front cover of The Economist, a magazine that has wide readership among the diplomatic and business communities in the United Kingdom and the rest of Europe. A Trump caricature is shown with a bullhorn in the shape of a KKK hood. Currently, there are 23 chargés in Washington, but very few of these have been left running their missions because of political problems. Venezuela, Bolivia, Sudan, Eritrea, and Belarus withdrew their ambassadors some time ago amid diplomatic rifts with the United States. Other nations, including Uganda, the Philippines, Gambia, St. Lucia, Zambia, Hungary, and Argentina just have not gotten around to naming new ambassadors, which has nothing to do with Trump. However, the absence of a European Union ambassador in Washington may have something to do with Trump’s repeated criticism of the organization. Ambassadors do not carry the clout that they once wielded in Washington under previous presidents. If nations decide to withdraw their ambassadors for “consultations,” diplomatic-speak for a subtle downgrading of relations, the functions of the embassies—issuing visas, conducting intelligence gathering, attending receptions, and lobbying Congress—would carry on with little overall impact on operations. When Trump signaled his willingness to move the U.S. embassy in Israel from Tel Aviv to Jerusalem, some Arab leaders called for the closure of all Arab embassies in Washington. Nabih Berri, the speaker of Lebanon’s parliament and president of the Arab Inter-Parliamentary Union, called for such a boycott if Trump carried out his promise. However, the Trump administration put off its plan and the boycott never materialized. The aftermath of the 1967 Arab-Israeli War saw several Arab nations sever diplomatic relations with the United States. If a diplomatic boycott of the Trump emerges, expect it to start with the Nordic and Benelux blocs in Europe, perhaps followed by Germany, France, Ireland, and Greece. 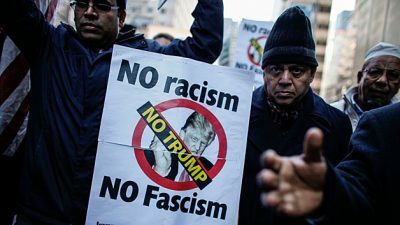 Trump’s support for the KKK activists in Charlottesville could also see a negative reaction from Africa, with South Africa being the most likely to join in a diplomatic boycott of Trump.